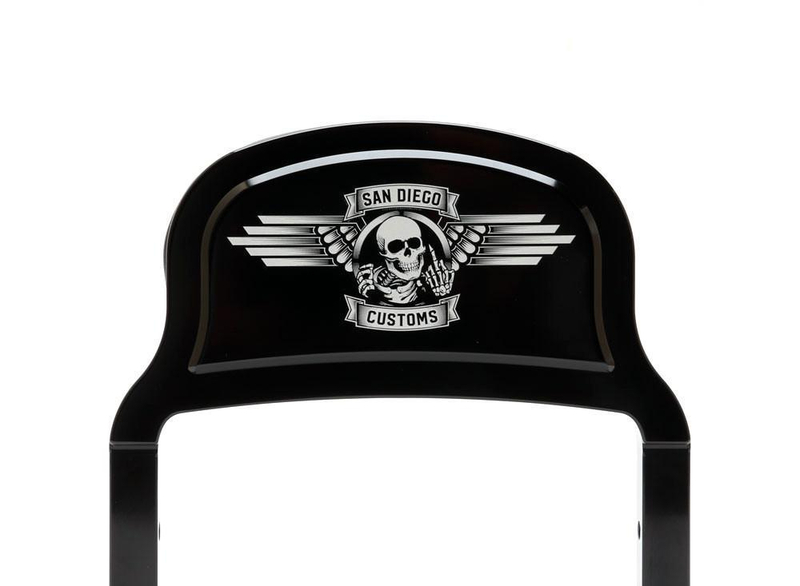 Check out the San Diego Customs sissy bars at DeadbeatCustoms.com! This 3-piece design consists of a billet sissy bar, back plate, and backrest pad. All hardware and mount points are concealed and designed to compliment your seat but not take away from your motorcycles look. The SDC sissy bars provide lower back support for your passenger and work with most Harley Davidson and aftermarket side plates. These sissy bars come in gloss or stealth black; with F*ck Off, the San Diego Customs Ripper logo, or a small SDC logo on the back plate. Not only do these sissy bars look rad but they’re comfortable- your passenger will thank you! Available in small, medium, and large ranging in different widths and heights.